Do you know which is the newest national park in the US? And one of the smallest ones, too? One where you need a flashlight to climb through caves? One which will amaze you with its unique rock formations? One which is home to the famous California condors? The answer for all of these questions is: Pinnacles. 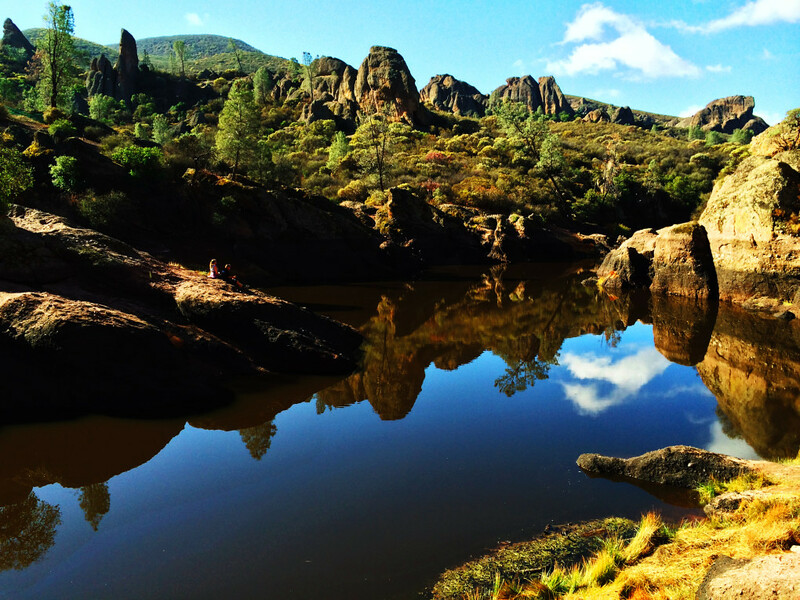 Pinnacles National Park is a real gem hidden in California’s continental area. 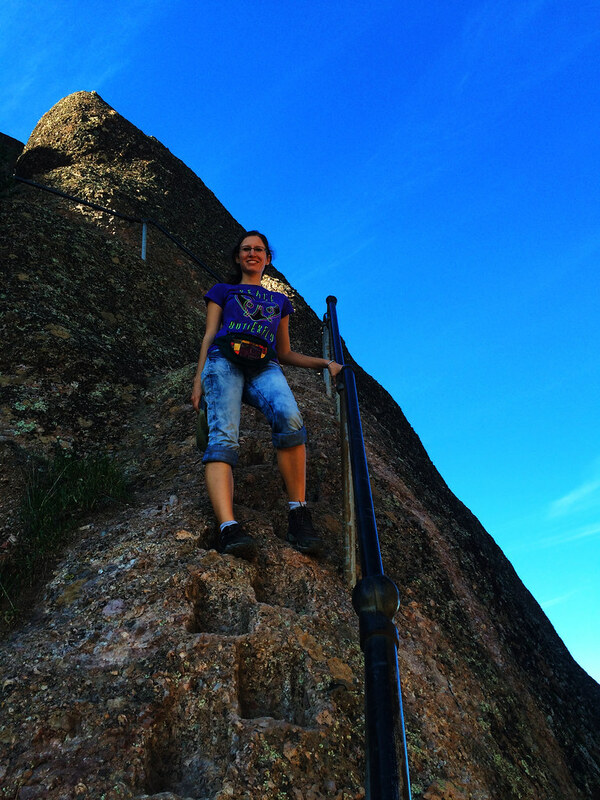 Probably it’s more well-known among rock climbers than hikers, because the rock formations are just paradise for them. But they were paradise for our eyes, too! There’s two entrances to the park and there’s no road connection between them, so it’s worth checking the trailheads to decide which one to choose. The entrances are connected with each other through several trails though and it’s not so hard to do a loop around the park if you have a full day. We used the East entrance every time we went there, because there’s a lot more trails starting from there then from the West entrance. 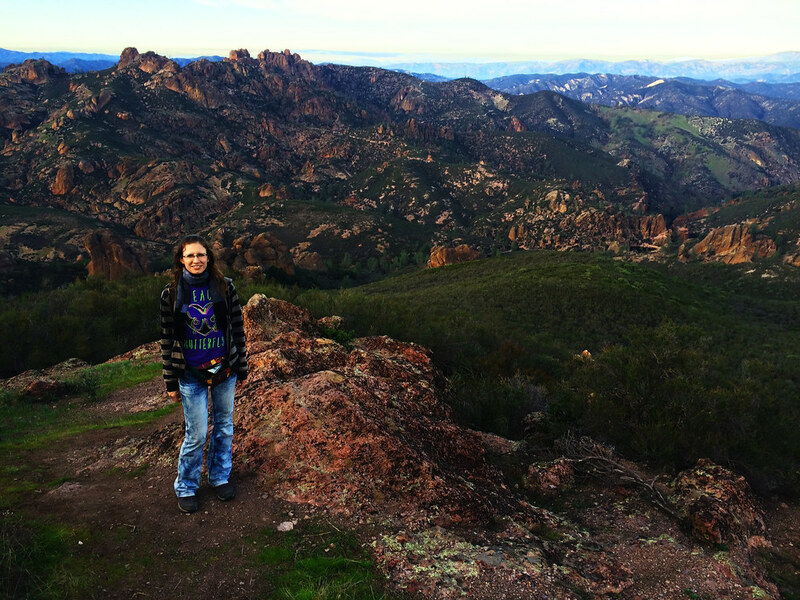 Our favorite trail is a loop through High Peaks Trail which is the most scenic part of the park with the view of hundreds of pinnacles around you. We started this loop from Bear Gulch Day Use Area on Condor Gulch Trail which led us to High Peaks Trail itself. This trail led us back to Bear Gulch Day Use Area through Bear Gulch Reservoir and Bear Gulch Cave. If you only have a day (or a half at least), we’d definitely recommend this loop as it features everything what is special in this park. Some of the trails in the park lead through caves and that’s an awesome addition. It’s not hard to get through the caves and it’s a lot of fun! Just make sure you have flashlight because you will really need it. 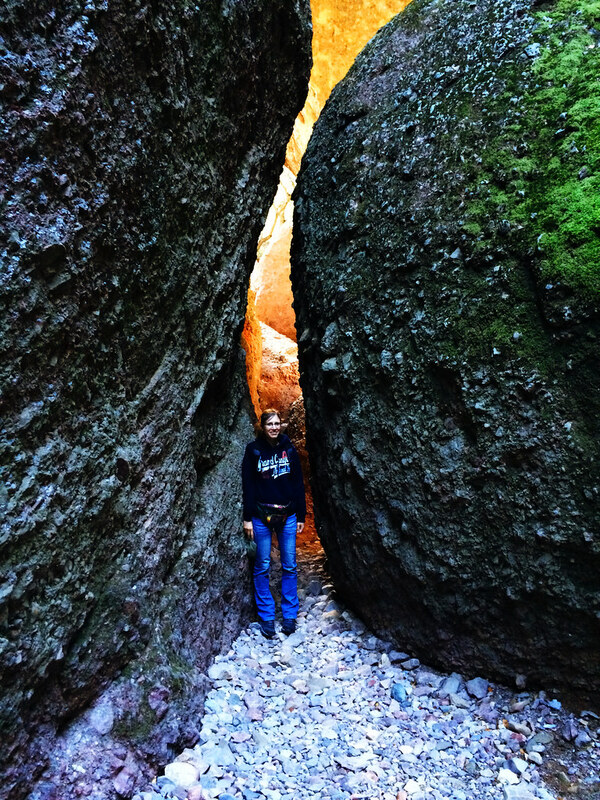 As for the caves whatever entrance you choose there’s a cave close by: Balconies Cave Trail is close to the West Entrance and Bear Gulch Cave Trail to the East Entrance. Bear Gulch Day Use Area is not only the starting point of several wonderful trails, but it’s also great for a picnic. Even from the parking lot you have a nice view of some rock formations, but we suggest to take the short trail to Bear Gulch Reservoir (including or excluding the way through the cave, the choice is yours). There’s several picnic spots with benches on the way and the reservoir itself is also a beautiful place to chill out. With its 3304 feet (1007 metres) height North Chalone Peak is the highest in the park. The trail to the summit start from Bear Gulch Reservoir and you get views of the pinnacles from a different angle as you you climb above them. Panorama from the summit is again different: the pinnacles are even further in the distance and you see the surrounding hills and smaller mountains. North Chalone Peak Trail is a steep one, but it’s not very long (~3.5 miles one way). In case you are wondering: it’s possible to do the High Peaks Trail and climb to North Chalone Peak on the same day, but it will be an intensive and long day then – yeah, we have sharp memories about it. 🙂 You’ll have more time to relax on the way if you do them separately. This park is typically one which could be your perfect choice in autumn and winter as spring and summer is very hot here. 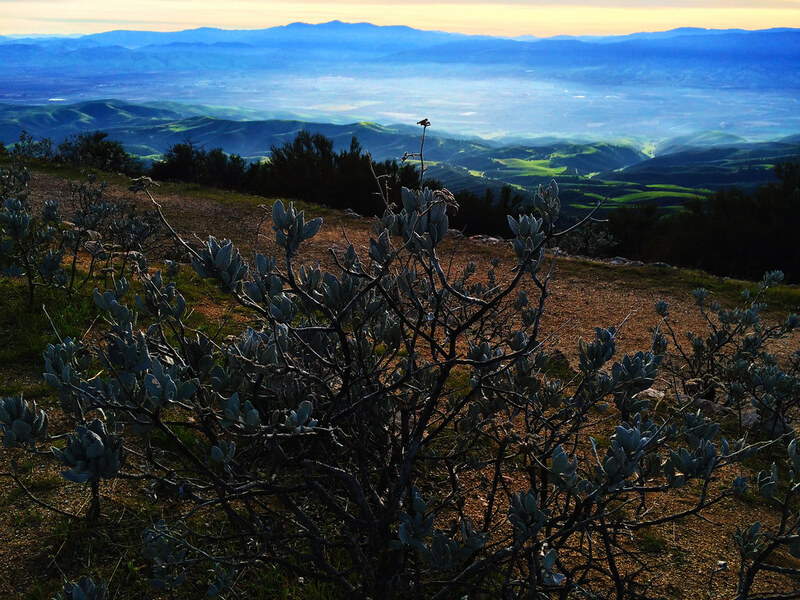 Autumn and winter hikes are far more pleasant, but even that time you better have plenty of water. 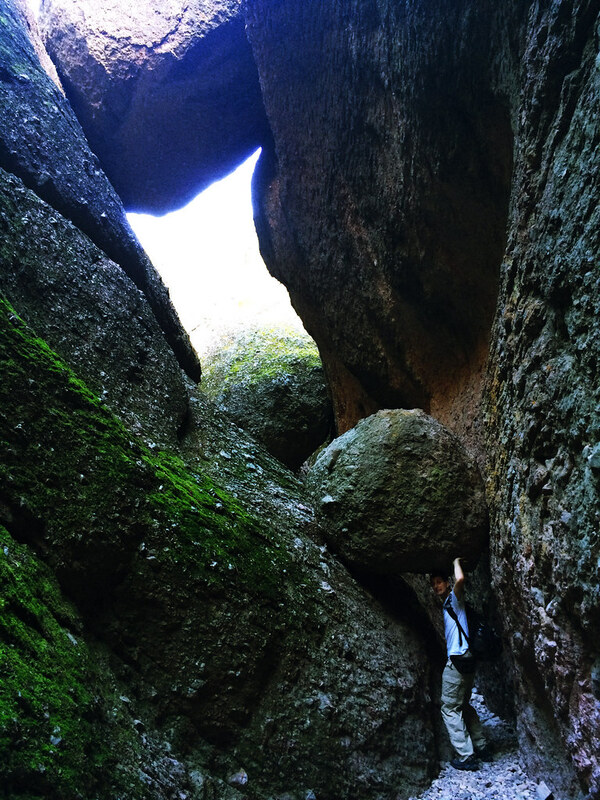 As always, it’s worth checking the National Park Service homepage about Pinnacles for current conditions before you go (the caves are sometimes closed). Also, you can find all the useful details and maps there. Have you heard about Pinnacles? Do you want to visit it? Looks great. Now on my list for next visit in the West. Hello, thanks for the info! 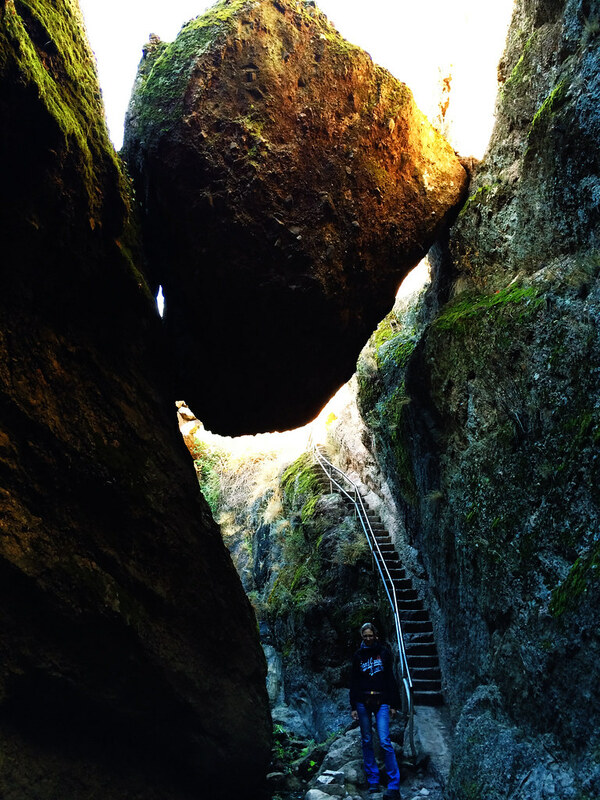 Which trail is the picture from where the staircase is under the suspended rock?